For other uses, see Mayak (disambiguation). The Mayak Production Association (Russian: Производственное объединение «Маяк», from Маяк 'lighthouse') is one of the biggest nuclear facilities in the Russian Federation, housing a reprocessing plant. The closest settlements are Ozyorsk to the northwest and Novogornyj [ru] to the south. Lavrenti Beria led the Soviet atomic bomb project. He directed the construction of the Mayak Plutonium plant in the Southern Urals between 1945–48, in a great hurry and in secrecy as part of the Soviet Union's atomic bomb project. Upwards of 40,000 Gulag prisoners and POWs built the factory and the closed nuclear city of Ozersk, called at the time by its classified postal code "Forty." Five (today closed) nuclear reactors were built to make, refine, and machine Plutonium for weapons. Later the plant came to specialize in reprocessing spent nuclear fuel from nuclear reactors and plutonium from decommissioned weapons. Once production started up, Soviet engineers quickly ran out of underground space for storage of high level radioactive waste. Rather than cease production of plutonium until new underground waste storage tanks could be built, between 1949 and 1951 Soviet managers dumped 7.8 cubic yards of toxic chemicals including 3.2 million curies of high-level radioactive waste into the Techa River, a slow-moving hydraulic system that bogs down in swamps and lakes. Downriver, 124,000 people lived along the river. They used the river for drinking water, irrigation, bathing and fishing. Investigators in 1951 found communities along the river highly contaminated. On discovery, soldiers immediately evacuated the first downriver village of Metlino, population 1,200, where radiation levels measured 3.5-5 rads/hr. At that dose, people could get a lifetime external dose in less than a week. Over the course of the following decade, ten additional communities were resettled from the river, but the largest community, Muslumovo, remained. Researchers investigated residents of Muslumovo annually in what has become a four-generation living experiment of people living among chronic, low doses of radioactivity. Blood samples showed that villagers of Muslumovo had received both external and internal doses of cesium-137, ruthenium-106, strontium-90, and iodine-131. These isotopes had deposited in organs, flesh and bone marrow. Villagers complained of a range of illnesses and symptoms--chronic fatigue, sleep and fertility problems, weight loss and increased hypertension. The frequency of birth defects and complications at birth were up to three times greater than normal. In 1953, doctors examined 587 of 28,000 exposed people and found that 200 had clear cases of radiation poisoning. In 1957 Mayak was the site of the Kyshtym disaster, one of the worst nuclear accidents in history. During this catastrophe, a poorly maintained storage tank exploded, releasing 20 million curies in the form of 50-100 tons of high-level radioactive waste. The resulting radioactive cloud contaminated an expansive territory of more than 750 km2 (290 sq mi) in the eastern Urals with the consequence of sickness and death from radiation poisoning. The Soviet regime kept this accident secret for about thirty years. The event was eventually rated at 6 on the seven-level INES scale, third in severity only to the disasters at Chernobyl in Ukraine and Fukushima in Japan. Mayak is still active as of 2017, and it serves as a reprocessing site for spent nuclear fuel. Today the plant makes tritium and radioisotopes, not plutonium. In recent years, proposals that the plant reprocess waste from foreign nuclear reactors have given rise to controversy. An incompletely reported accident appears to have occurred in September 2017. Satellite image/map of the Mayak nuclear facility. Fissile Material Storage Facility (FMSF). Looking at administration building of the storage facility to include all the support facilities. Excavator is one of the pieces of construction equipment procured by the USACE. The nuclear complex is located 150 km south-east of Ekaterinburg, between the towns of Kasli and Tatysh, Mayk 55.6951 N, 60.8026 E and 72 km northwest of Chelyabinsk. The closest city, Ozyorsk, is the central administrative territorial district. 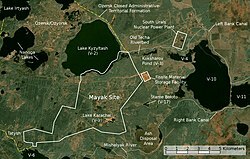 As part of the Russian (formerly Soviet) nuclear weapons program, Mayak was formerly known as Chelyabinsk-40 and later as Chelyabinsk-65, referring to the postal codes of the site. Mayak's nuclear facility plant covers about 90 square kilometers. The site borders Ozyorsk, in which a majority of the staff of Mayak live. Mayak, itself, was not shown on Soviet public maps. The location of the site together with the plant city was chosen to minimize the effects that harmful emissions could potentially have on populated areas. Mayak is surrounded by a ~250 km2 exclusion zone. Nearby is the site of the South Urals nuclear power plant. Built in total secrecy between 1945 and 1948, the Mayak plant was the first reactor used to create plutonium for the Soviet atomic bomb project. In accordance with Stalinist procedure and supervised by NKVD Chief Lavrenti Beria, it was the utmost priority to produce enough weapons-grade material to match the U.S. nuclear superiority following the atomic bombings of Hiroshima and Nagasaki. Little to no consideration was paid to worker safety or responsible disposal of waste materials, and the reactors were all optimized for plutonium production, producing many tons of contaminated materials and utilizing primitive open-cycle cooling systems which directly contaminated the thousands of gallons of cooling water the reactors used every day. Lake Kyzyltash was the largest natural lake capable of providing cooling water to the reactors; it was rapidly contaminated via the open-cycle system. The closer Lake Karachay, too small to provide sufficient cooling water, was used as a dumping ground for large quantities of high level radioactive waste too "hot" to store in the facility's underground storage vats. The original plan was to use the lake to store highly radioactive material until it could be returned to the Mayak facility's underground concrete storage vats, but this proved impossible due to the lethal levels of radioactivity. The lake was used for this purpose until the Kyshtym Disaster in 1957, in which the underground vats exploded due to a faulty cooling system. This incident caused widespread contamination of the entire Mayak area (as well as a large swath of territory to the northeast). This led to greater caution among the administration, fearing international attention, and caused the dumping grounds to be spread out over a variety of areas (including several lakes and the Techa River, along which many villages lay). Fissile Material Storage Facility (FMSF). Looking at the south side of the main Administration Building and security building of the storage facility. Working conditions at Mayak resulted in severe health hazards and many accidents. The most notable accident occurred on 29 September 1957, when the failure of the cooling system for a tank storing tens of thousands of tons of dissolved nuclear waste resulted in a chemical (non-nuclear) explosion having an energy estimated at about 75 tons of TNT (310 gigajoules). This released 740 PBq (20 MCi) of fission products, of which 74 PBq (2 MCi) drifted off the site, creating a contaminated region of 15,000-20,000 km2 called the East Urals Radioactive trace. Subsequently, an estimated 49 to 55 people died of radiation-induced cancer, 66 were diagnosed with chronic radiation syndrome, 10,000 people were evacuated from their homes, and 470,000 people were exposed to radiation. The Soviet Union did not release news of the accident and denied it happened for nearly 30 years. Residents of Chelyabinsk district in the Southern Urals reported observing "polar-lights" in the sky near the plant, and American aerial spy photos had documented the destruction caused by the disaster by 1960. This nuclear accident, the Soviet Union's worst before the Chernobyl disaster, is categorized as a Level 6 "Serious Accident" on the 0–7 International Nuclear Events Scale. When Zhores Medvedev exposed the disaster in a 1976 article in New Scientist, some exaggerated claims circulated in the absence of any verifiable information from the Soviet Union. People "grew hysterical with fear with the incidence of unknown 'mysterious' diseases breaking out. Victims were seen with skin 'sloughing off' their faces, hands and other exposed parts of their bodies." As Zhores wrote, "Hundreds of square miles were left barren and unusable for decades and maybe centuries. Hundreds of people died, thousands were injured and surrounding areas were evacuated." Professor Leo Tumerman, former head of the Biophysics Laboratory at the Institute of Molecular Biology in Moscow, disclosed what he knew of the accident around the same time. Russian documents gradually declassified from 1989 onward show the true events were less severe than rumored. According to Gyorgy, who invoked the Freedom of Information Act to open up the relevant Central Intelligence Agency (CIA) files, the CIA knew of the 1957 Mayak accident all along, but kept it secret to prevent adverse consequences for the fledgling USA nuclear industry. "Ralph Nader surmised that the information had not been released because of the reluctance of the CIA to highlight a nuclear accident in the USSR, that could cause concern among people living near nuclear facilities in the USA." Only in 1992, shortly after the fall of the USSR, did the Russians officially acknowledge the accident. Looking at storage facility processing materials, controls, accountability, and fissile material container storage from south-west angle. In December 1968, the facility was experimenting with plutonium purification techniques. Two operators were using an "unfavorable geometry vessel in an improvised and unapproved operation as a temporary vessel for storing plutonium organic solution." "Unfavorable geometry" means that the vessel was too compact, reducing the amount of plutonium needed to achieve a critical mass to less than the amount present. After most of the solution had been poured out, there was a flash of light and heat. After the complex had been evacuated, the shift supervisor and radiation control supervisor re-entered the building. The shift supervisor then entered the room of the incident, caused another, larger nuclear reaction and irradiated himself with a deadly dose of radiation. This tale has since made its way into popular culture, being found in the website DarwinAwards.com. Abnormally high levels of radiation were reported in the area of the facility in November 2017. Simultaneously, traces of radioactive manmade isotope Ruthenium-106 spread across Europe in September and October, it had never been seen on a continental scale since the Chernobyl accident. In January 2018, the French Institute of Radioprotection and Nuclear Security (IRSN) reported that the source of the contamination is located in the Volga - Southern Ural region between September 25 and 28 for a duration of less than 24 hours. The report excludes the possibility of an accidental release from a nuclear reactor, stating that it seems related with irradiated fuels processing or the production of sources from fission products solution. It points to Mayak's aborted attempt to manufacture a capsule of highly radioactive component cerium-144, for the Italian Borexino supernova detection project. For now both the Russian government and Rosatom have denied that another accidental leak took place at Mayak. The release of a cloud of ruthenium-106, is similar to the B205 reprocessing accident in Britain in 1973. In the early years of its operation, the Mayak plant directly discharged high-level nuclear waste into several small lakes near the plant, and into the Techa River, whose waters ultimately flow into the Ob River. Mayak continues to dump low-level radioactive waste directly into the Techa River today. Medium level waste is discharged into the Karachay Lake. According to the data of the Department of Natural Resources in the Ural Region, in the year 2000, more than 250 million m³ of water containing thousands of curies of tritium, strontium, and cesium-137 were discharged into the Techa River. The tritium concentration, alone, in the Techa River near the village Muslyumovo exceeds the permissible limit by 30 times. Rosatom, a state-owned nuclear operations corporation, began to resettle residents of Muslyumovo in 2006. However, only half of the residents of the village were moved. People continue to live in the immediate area of the plant, including Ozersk and other downstream areas. Residents report no problems with their health and the health of Mayak plant workers. However, these claims lack hard verification, and many who worked at the plant in 1950s and 1960s subsequently died from the effects of radiation. While the situation has since improved, the administration of the Mayak plant has been repeatedly criticized in recent years by Greenpeace and other environmental advocates for environmentally unsound practices. Fissile Material Storage Facility (FMSF). The building is the ventilation center of the storage facility. The ventilation tunnel showing in the north of the ventilation center. 15/03/1953 - Criticality accident. Contamination of plant personnel occurred. 13/10/1955 - Rupture of process equipment and the destruction of a process building. 21/04/1957 - Criticality accident. One operator died from receiving over 3000 rad. Five others received doses of 300 to 1,000 rem and temporarily became sick with radiation poisoning. 02/01/1958 - Criticality accident in SCR plant. Plant workers conducted experiments to determine the critical mass of enriched uranium in a cylindrical container with different concentrations of uranium in solution. Personnel received doses from 7600 to 13,000 rem, resulting in three deaths and one case of blindness caused by radiation sickness. 12/05/1960 - Criticality accident. Five people were contaminated. 26/02/1962 - Destruction of equipment. An explosion occurred in the absorption column. 16/12/1965 - Criticality accident. Seventeen individuals received exposure to small amounts of radiation over a period of 14 hours. 10/12/1968 - Criticality accident. Plutonium solution was poured into a cylindrical container with dangerous geometry. One person died, another took a high dose of radiation and radiation sickness, after which he had both legs and his right arm amputated. 11/02/1976 - Unsafe actions of staff development at the radiochemical plant caused an autocatalytic reaction of concentrated nitric acid and organic liquid complex composition. The device exploded, contaminating the repair zone and areas around the plant. The incident merited an International Nuclear Event Scale rating of 3. 16/11/1990 - Explosion. Two people received burns and one was killed. 07/17/1993 - Accident at radioisotope plant, resulting in the destruction of the absorption column and release into the environment of a small amount of α-aerosols. Radiation emission was localized at the manufacturing facility of the shop. 08/02/1993 - Depressurization of a pipeline caused 2 m³ of radioactive slurry (about 100 m² of contaminated surface) to leak to the surface of the pulp radioactive activity of about 0.3 Ci. Radioactive trace was localized, contaminated soil removed. 12/27/1993 - Incident at radioisotope plant where the replacement of a filter resulted in the release into the atmosphere of radioactive aerosols. Emissions were on the α-activity of 0.033 Ci, and β-activity of 0.36 mCi. 04/02/1994 - Recorded increased release of radioactive aerosols: the β-activity of 2-day levels of Cs-137 subsistence levels, the total activity of 7.15 mCi. 30/03/1994 - Recorded excess daily release of Cs-137 in 3, β-activity - 1,7, α-activity - by 1.9 times. In May 1994 the ventilation system of the building of the plant spewed activity 10.4 mCi β-aerosols. Emission of Cs-137 was 83% of the control level. 07/07/1994 - The control plant detected a radioactive spot area of several square decimeters. Exposure dose was 500 millirems per second. The spot was formed by leaking sewage. 31/08/1994 - Registered an increased release of radionuclides to the atmospheric pipe building reprocessing plant (238.8 mCi, with the share of Cs-137 was 4.36% of the annual emission limit of this radionuclide). The reason for the release of radionuclides was depressurization of VVER-440 fuel elements during the operation segments idle all SFA (spent fuel assemblies) as a result of an uncontrollable arc. 24/03/1995 - Recorded excess of 19% of normal loading apparatus plutonium, which can be regarded as a dangerous nuclear incident. 15/09/1995 - High-level liquid radioactive waste (LRW) was found in flow of cooling water. Operation of a furnace into the regulatory regime has been discontinued. 21/12/1995 - Cutting of a thermometric channel exposed four workers (1.69, 0.59, 0.45, 0.34 rem) when operators violated process procedures. 24/07/1995 - Cs-137 aerosols released, the value of which amounted to 0.27% of the annual value of MPE for the enterprise. 14/09/1995 - Replacement covers and lubrication step manipulators registered a sharp increase in airborne α-nuclides. 22/10/1996 - Depressurization occurred in a coil while channeling cooling water from one storage tanks of high-level waste. The result was contaminated pipe cooling system repositories. As a result of this incident, 10 people were exposed to radiation dose of 2.23 to 48 milli-Sieverts. 20/11/1996 - A chemical-metallurgical plant in the works on the electrical exhaust fan caused aerosol release of radionuclides into the atmosphere, which made up 10% of the allowed annual emissions of the plant. 27/08/1997 - In building RT-1 in one of the rooms was found to be contaminated floor area of 1 to 2 m², the dose rate of gamma radiation from the spot was between 40 and 200 mR / s.
06/10/1997 - Recorded increasing radioactivity in the assembly building, the RT-1. Measurement of the exposure dose indicated up to 300 mR / s.
23/09/1998 - While increasing power output of reactor P-2 ("Lyudmila") after engaging automatic protection allowable power level was exceeded by 10%. As a result, the three channels of the fuel rod seal failed, resulting in the contamination of equipment and pipelines of the first circuit. In 2003, the plant's operating licence was revoked temporarily due to liquid radioactive waste handling procedures resulting in waste being disposed into open water. In June 2007, an accident involving a radioactive pulp occurred over a two-day period. In October 2007, a valve failure during transport of a radioactive liquid resulted in spilling of a radioactive material. In 2008, a repair worker was injured during a "pneumatic" incident, involving a quantity of alpha emitter release. The worker's hand was injured and the wound contaminated, with the worker's finger amputated in a bid to minimise further spread of alpha-particle emitters throughout his body and subsequent radiological consequences. In September 2017, possible association with the airborne radioactivity increase in Europe in autumn 2017. Russia confirms 'extremely high' readings of radioactive pollution in Argayash, a village in the Chelyabinsk region of the southern Urals. Argayash is located 10 miles south of the Mayak reactor. In January 2018, the French Institute of Radioprotection and Nuclear Security (IRSN) reported that Mayak could be the cause of the contamination. ^ "All enterprises". Rosatom.ru. Archived from the original on 21 April 2017. Retrieved 18 June 2017. ^ Brown, Kate (2013). Plutopia: Nuclear Families, Atomic Cities, and the Great Soviet and American Plutonium Disasters. Oxford: Oxford University Press. ISBN 9780199855766. OCLC 813540523. ^ Brown, Kate. Plutopia: nuclear families, atomic cities, and the great Soviet and American plutonium disasters. ISBN 9780190233105. OCLC 892040856. ^ a b c d "Kyshtym Disaster". Nuclear-Heritage.net. 6 January 2014. Archived from the original on 26 October 2014. Retrieved 25 October 2014. ^ Walker, Shaun (2 July 2017). "Russia begins cleaning up the Soviets' top-secret nuclear waste dump". The Guardian. Retrieved 7 July 2017. ^ Luxmoore, Matthew; Cowell, Alan. "Russia, in Reversal, Confirms Radiation Spike". New York Times. Retrieved 21 November 2017. ^ Will Standring (2006). "Review of the current status and operations at Mayak Production Association" (PDF). Norwegian Radiation Protection Authority. ^ Name (required). "Nuclear History – the forgotten disasters". Nuclear-news.net. Retrieved 7 July 2017. ^ a b "Mayak Production Association | Facilities". NTI. Archived from the original on 6 July 2017. Retrieved 7 July 2017. ^ Larin, Vladislav (September – October 1999). "Mayak's walking wounded". Bulletin of the Atomic Scientists. 55 (5): 20–27. doi:10.2968/055005008. ^ Gusev, Igor A.; Gusʹkova, Angelina Konstantinovna; Mettler, Fred Albert (28 March 2001). Medical Management of Radiation Accidents. CRC Press. pp. 15–29. ISBN 978-0-8493-7004-5. Archived from the original on 2 January 2014. Retrieved 11 June 2012. ^ "The nuclear disaster of Kyshtym 1957 and the politics of the Cold War". Arcadia. Environment and Society. 2012. Archived from the original on 26 October 2014. Retrieved 25 October 2014. ^ "Mayak Enterprise criticality accident, 1968." Mayak Enterprise criticality accident, 1968. Accessed December 10, 2017. http://www.johnstonsarchive.net/nuclear/radevents/1968USSR2.html. ^ "Absolutely Radiant". Darwin Awards. ^ a b Devlin, Shaun Walker Hannah (21 November 2017). 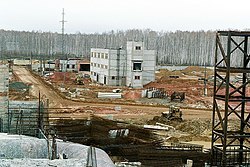 "Russian nuclear facility denies it is source of high radioactivity levels" – via www.theguardian.com. ^ a b IRSN (January 2018). "Report on IRSN investigations of Ru 106 in Europe in October 2017" (PDF). www.irsn.fr. Retrieved 16 February 2018. ^ "Mishandling of spent nuclear fuel in Russia may have caused radioactivity to spread across Europe". Science | AAAS. 14 February 2018. Retrieved 16 February 2018. ^ Koshurnikova, N.A. ; Shilnikova, N.S. ; Sokolnikov, M.E. ; Bolotnikova, M.G. ; Okatenko, P.V. ; Kuznetsova, I.S. ; Vasilenko, E.K. ; Khokhryakov, V.F. ; Kreslov, V.V. (2006). "Medical-dosimetry registry of workers at the 'Mayak' production association". International Journal of Low Radiation. Inderscience Publishers. 2 (3/4): 236–242. doi:10.1504/IJLR.2006.009516. Retrieved 6 January 2012. ^ Azizova, Tamara V.; Muirhead, Colin R.; Moseeva, Maria B.; Grigoryeva, Evgenia S.; Sumina, Margarita V.; O’Hagan, Jacqueline; Zhang, Wei; Haylock, Richard J. G. E.; Hunter, Nezahat (2011). "Cerebrovascular diseases in nuclear workers first employed at the Mayak PA in 1948–1972". Radiation and Environmental Biophysics. Springerlink. 50 (4): 539–552. doi:10.1007/s00411-011-0377-6. PMID 21874558. Retrieved 6 January 2012. ^ "Sources and Effects of Ionizing Radiation – 2008 Report to the General Assembly" (PDF). United Nations Scientific Committee on the Effects of Atomic Radiation. 2011. Annex C: Radiation exposures in accidents. Archived (PDF) from the original on 31 May 2013. ^ "Russia confirms 'extremely high' readings of radioactive pollution". Yahoo News. Retrieved 3 December 2017. Wikimedia Commons has media related to Mayak nuclear facility.